Synology has released an update to the venerable DS713+, called the DS715, and has made the bold move of replacing the Intel Atom CPU with a relatively unknown Alpine AL-314. Let’s take a hard look at this latest unit to see how the updates, overall feature set, and performance rank up. We’ve reviewed our fair share of NAS units (Network Attached Storage) from Synology over the years, and every time we are left impressed. The next unit we have under test is a more business class offering in the form of the DS715. The feature list for the DS715 is both impressive and daunting if you are not up to speed on a lot of network terminology. For the most part though, if you can think of a network feature, this NAS can probably do it. From simple file storage, to user and group management and quotas, DHCP server, FTP, Media server, automated backups, Web server, LDAP, iSCSI, network and unit failover, personal cloud storage, and on and on. Before we get into the juggernaut that is the DiskStation Management (the operating system for the NAS), we’ll go over some of the hardware features first. Synology’s business based NAS units offer something interesting in the form of expansions – dedicated storage clusters that can be hooked up when storage requirements exceed the original NAS. With the DS715, this comes in the form of a 5-bay expansion unit, the DX513, which is hooked up by a dedicated eSATA port on the back, bringing the total to 7-bays. The DS715 by itself is a rather overspeced beast for a 2-bay NAS, but it was designed with the possibility of handling the additional 5-bay expansion. There is a slight catch with this particular NAS compared to many others in Synology’s range, and it’s the CPU. Equipped with an Alpine AL-314 by Annapurna Labs, it’s a quad-core ARM-based SoC running at 1.4GHz, with a leading feature being hardware based encryption. The fact that Synology hasn’t gone with a more common Intel Atom of Marvell SoC means that some expected features might be missing, namely that of Plex support since it doesn’t have media transcoding capabilities ready yet in software. However, Plex is definitely a Home NAS feature and there are plenty of other Synology NAS units that support it, such as the various ‘play’ editions. Going with the AL-314 was probably the result of finding a cheap chip with the most features, but with less power than an Atom. We can only guess at the real reasons, but the chip is more than capable of powering this NAS, plus the 5-bay expansion. With 2GB of DDR3 RAM and dual gigabit NICs that can be aggregated or put into an active failover state, there are a number of features that will keep businesses and home users happy. The inclusion of dedicated SSD caching piqued my interest too, as for large arrays, that would help significantly in busy environments. Originally, I had thought that there were dedicated SSD ports, separate from the main disk drives, but that is only available in other models. The other catch is that in order to enable write caching (instead of just read), the DS715 requires two SSDs in RAID1, and since there are no spare dedicated ports, the DS715 itself becomes a control hub for the caching (you will need the DX513 for actual storage). 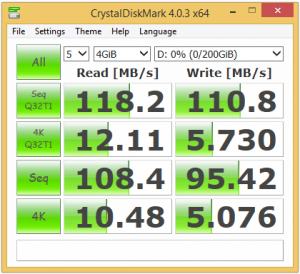 The caching can be trained periodically or manually within the software, keeping frequent files on the SSDs. It also works at the block level and not just files, allowing it to significantly improve the performance of iSCSI arrays. 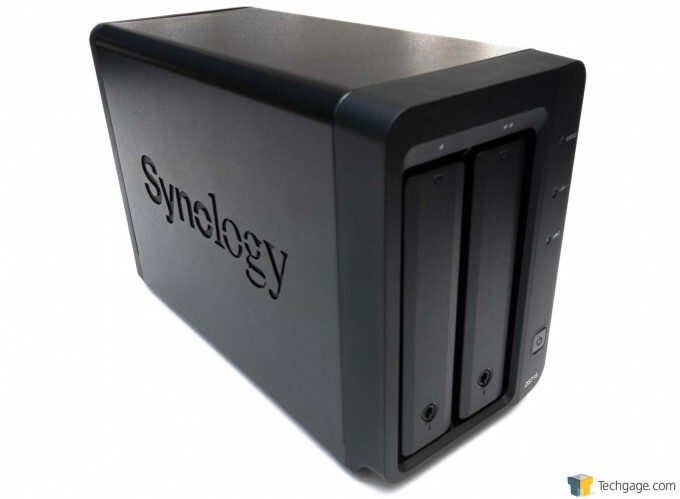 The Synology DS715, a 2-bay NAS for businesses. A 90mm fan on the rear keeps things cool and quiet. The individual hard drive bays, complete with small locks. Rear I/O - Dual Gigabit network, two USB 3.0 ports, eSATA, power, and a kensington lock. Hard drive bays with spring-loaded door. The hard drives inside their caddies. Hard drives are secured to the caddy with a tool-less mounting system, complete rubber mounts to minimize noise and vibration. Full accesory pack, includes power adapter and plug, keys and two CAT 5e Network Cables. Close up on the power connector, typical 12V supply, rated up to 72Watts. The plastic keys for the drive bays - these are rather fragile. The DS715 is an update to the now aging DS713+. The two are remarkably similar in many regards, with a few exceptions. Depending and what you are after in a NAS, the DS715 may be a downgrade in some areas and an upgrade in others. It offers 2GB of ram rather than 1GB, support for more IP cameras, and consumes 30-40% less power. However, it does lack any of the virtualization features, as well as reduced active cloud and VPN connections. 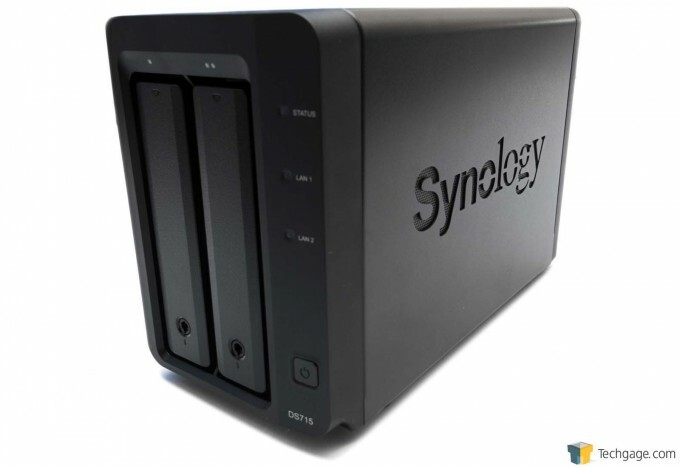 A full feature comparison between the two can be found on Synology’s website. One final difference is the removal of the front USB 2.0 port. The DS715 only has two USB 3.0 ports on the rear, used for external storage (for backing up the NAS or additional sharing), or for connecting a wireless dongle to turn the NAS into a wireless access point. The eSATA port is for connecting up the DS715 to the 5-bay expansion unit, the DX513. The hard drive bays are spring-loaded with small locks on the front to prevent easy access. My only real criticism is that the keys are a really cheap plastic and feel like they could break if you twist them slightly too hard. 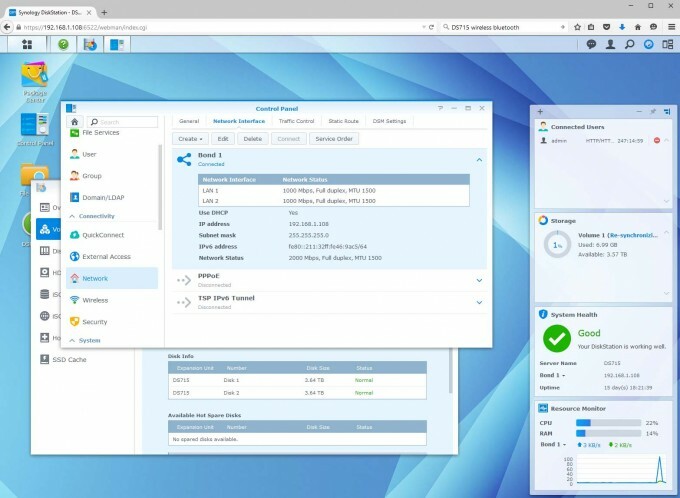 What sets Synology apart from a lot of other NAS manufacturers is the operating system – DSM, DiskStation Management. The ease with which a lot of features can be accessed and setup can not be underestimated. The intuitive interface and a massive library of help and documentation to guide you through some of the more complex tasks, is a breath of fresh air. The depth with which the software can get into is well beyond the scope of this review, so we will only be covering a small fraction of what it’s capable of. If you can not find the NAS, then you will have to find the IP address of it and use that as the URL. If you have configured the NAS to use a different port (as part of the security options), then use that port instead of 5000. Once you are presented with the login screen, the default login is admin with a blank password. The setup process will guide you through many of the basic options, including cloud storage setup using your MyDS account (which you can create online during the process). A lot of this can be skipped and set up later if you don’t intend to use it. 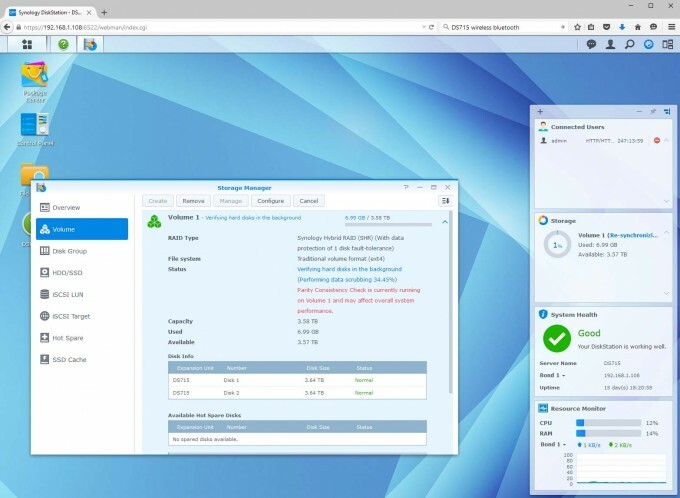 The default configuration is to have the two hard drives (2x 4TB Seagate NAS drives in our case) setup in something called SHR – Synology Hybrid RAID, which is effectively RAID1 (mirrored) but with the ability to setup different sized hard drives. You can read our primer on the different types of RAID if you are interested. The help section that loads up on the desktop is very comprehensive and will guide you through the simple to the complex. Its security section will help you set up the NAS by changing default ports, configure certifications and locking down various options to keep your system safe. QuickConnect will help you setup your own personal cloud storage and access without worrying about port forwarding with your router; this also ties in with the Cloud Station plugin package. Speaking of plugins, this is where you can add or remove features with your NAS. During the quick setup, some will be included for you, which will help set up the various DLNA services, such as music, picture and movie streaming/sharing over the network with compatible devices. As noted previously, Plex is not currently supported by the DS715 due to the CPU; however, you can still stream media if the device, such as a phone or tablet, supports the native codec of what you are trying to play. In addition to the various media sharing plugins, there are server related plugins for FTP servers, Content Management Systems such as WordPress, Joomla and Drupal; you can even install version management systems like SVN and GIT. It’s possible to host your entire Intranet and forum software on the NAS if you wish. You can even setup the DS715 as a DHCP server and enable PPPoE, effectively turning the NAS into a router and cable modem. The DSM is incredibly comprehensive, frequently updated, and well-documented. If you are after something more than a dumb NAS, consider looking into the DSM and its feature suites (unless you plan to build your own server on a custom rig of course). Since the DS715 only has two RAID modes, there is not much to test regarding performance, as we do not have access to the DX513 for RAID 5 or 10 testing. The same goes for the SSD cache, as that’s meant to be used with the expansion unit, too. The other issue is a lack of proper link aggregation on the client side (the PC), so full bandwidth can not be tested. Link aggregation, sometimes referred to as bridging, is when more than one network interface is combined to create a single link between host and client, doubling up the bandwidth and performance. While two network interfaces are available on the PC, bridging them resulted in a very unstable system. 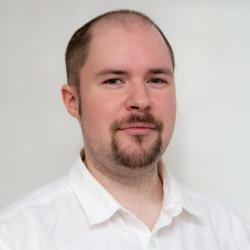 The lack of a proper server card is likely the main issue – one with native link aggregation support. This is less of a concern anyway, since under normal conditions, a HDD can not take advantage of 2Gbps – a single gigabit connection tops out at about 125MB/s, most hard drives are limited to 150MB/s at the edge of the disk and degrade quickly as they fill. 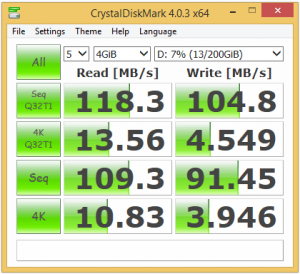 In order to take advantage of that kind of bandwidth, you’ll need to be transferring from SSDs over a wired connection (wireless would be a lot slower), or using multiple systems to access the NAS at the same time. However, we did perform a number of redundancy tests to make sure the NAS behaved itself when subjected to various forms of torture. The first was to disrupt the RAID1 array, force it to perform a parity check, and then perform benchmarks while its rebuilding the array. With the network interface set to failover mode, we began benchmarks and pulled a cable mid transfer, reinserted it, then pulled the other cable, to see if it could continue operations. For the last test, we began benchmarks and then pulled a hard drive mid transfer, to see if it failed or continued to operate (as it should). For throughput performance tests, we tried something a little more repeatable than simple timed file transfers, and the answer came from a feature that’s included in many NAS solutions now, that of iSCSI. By creating a hosted volume on the NAS that is accessed and used by the OS like a normal hard drive, we can check raw performance of the NAS by using hard drive testing applications. 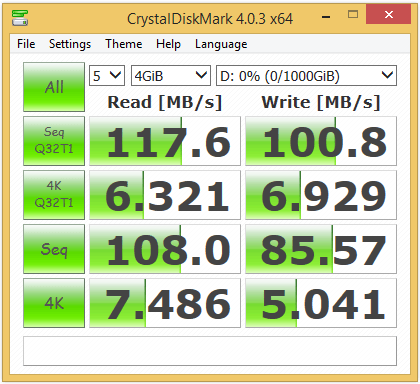 With reads of 118MB/s and writes of 105MB/s in CrystalDiskMark on RAID1, that’s some surprisingly good numbers. Even though gigabit can handle up to 125MB/s, it’s not completely achievable, so coming close to that is quite impressive. When the DS715 was rebuilding the array, performance stayed almost the same, with 4K random read and write taking a bit of a dive (as is expected). The difference between RAID1 and 0 was almost negligible, it’s only with multiple connections that performance difference would become apparent. Yanking the network cable did nothing to the results; it didn’t bat an eye-lid. The only issue arose when we pulled the other cable too soon after connecting up the old one. Pulling a hard drive mid transfer (while in RAID1) didn’t seem to cause a major hit to performance, but this is hard to spot due to the limited bandwidth. Rebuilding the array though, that will take a fair amount of time; expect many hours for it to complete. But you can still use the NAS without issue while the rebuild is taking place. Synology’s DS715 is an odd update in some regards, but interesting in others. Its clear performance isn’t an issue. It has almost the full DSM support behind it, and the possibility to be expanded. It sits in a middle-ground of business solutions and high-end home users, without the advantage of media transcoding. You have to ask yourself what you need a NAS for, what you intend to do with it, and what your priorities are. One of the key advantages of this latest model over many of the others, is the much reduced power requirements – 9 watts with the HDD hibernating and 21 watts in full use, compared to the 18W standby and 30W in-use of its predecessor, the DS713+. Many of the business options like LDAP, iSCSI, dual NICs with failover, and high availability configuration (combining two units in active and passive states to either load-balance or increase redundancy), and even the 30 IP camera capability, are what will make you spring for this unit over the more mainstream NAS units. If you need more up-front storage for your business, something like the DS1515 might be better, or you can get the DX513 5-bay expansion with the DS715 on purchase. The DSM makes for a delight when configuring the NAS, and we’ve consistently praised the OS for years now, here at Techgage. If you are looking at the DS715 purely as a 2-bay NAS, it’s very overspeced and feature rich, so you need to look at it in conjunction with the DX513, as well as take the added business functions into consideration. For a home user, this is likely overkill. In either case, it’s an extremely capable NAS, and you can find it on Amazon and Newegg for around $470. The DX513 can be had for around $500 or less. Be sure to get a couple WD Red or Seagate NAS hard drives, too. In all, a very worthwhile NAS for the right user or business, and worthy of our Editor’s Choice. Full of home and business features. DSM is a wonderful OS. The AL-314 is a relatively unknown SoC (but still competent).